Print, copy and scan with true color using the high performance HP Photosmart printer. Based on HP's scalable printing technology, this stylish printer is the world's fastest picture printer with 4x6 inch photo speed as fast as 12 seconds. 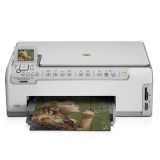 The HP Photosmart allows users to print laser quality documents and lab quality photos without a PC using USB flash memory drive and the big 2.4-inch color image display. - 21.00 bs (WxLxH) 11.97" x 17.60" x 9.10"